Wike playing politics with people’s lives –Amaechi - BlogIT with OLIVIA!!! The Minister of Transportation, Mr. Rotimi Amaechi, has accused the Governor of Rivers State, Mr. Nyesom Wike, of playing politics with the lives of the people of the state. He also accused Wike of not taking the development of the state seriously. Amaechi, a former governor of the state, said this in a statement in Abuja on Tuesday. He accused Wike of “twisting, butchering and turning the truth upside down; and in most cases telling outright lies in his failed bid to denigrate, tarnish and rubbish his towering image, person and laudable, landmark achievements. He said that most troubling was Wike’s alleged propensity, without any qualms whatsoever, to play politics with the safety and security of the lives of Rivers people. This, he said, was indeed most worrisome. 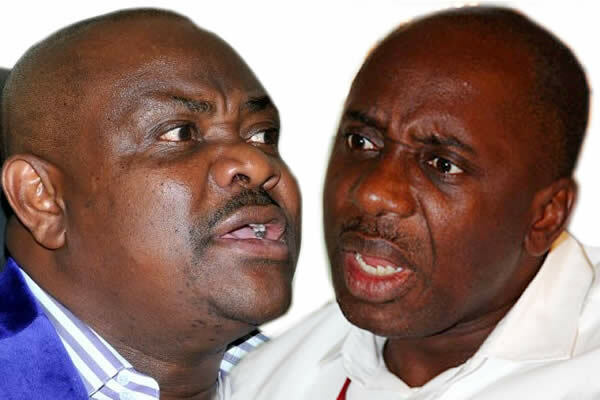 Amaechi said, “It is no secret that Wike plays politics with the development, welfare and well-being of Rivers people. “But no government should play politics with the safety and security of its citizens like Wike is sadly and shamelessly doing. “Governor Wike claimed that the brutal political killings and murder of the All Progressives Congress members and other hapless citizens in the state are cult-related or a result of cult clashes. “What cult wars is he talking about? Since he claimed to have security reports, we challenge Wike to tell Rivers people the cult group that Franklin Obi, the APC Ward Chairman in Omoku, belongs to, that led to his being gruesomely beheaded and butchered, alongside his pregnant wife and teenage son. The former governor challenged Wike to tell Nigerians the cult groups and the cult wars that led to the killing of the innocent youth corper, Chukwudumeibi Okonta, on the day of the last rerun election on March 19. “Was the youth corper a cultist or a victim of cult wars or yet another victim of politically-motivated killings in Rivers State?,” he asked. He also said that Wike must tell Rivers people the cult wars that led to the brutal murder of hundreds of Rivers people since the election that made him governor was held, and the cult groups that all those that had been murdered, belong to. He said that Wike’s cult wars/cultists claim was akin to insulting and spitting on the graves and memories of all those murdered and their families. Amaechi said, “With pity, we watched as Wike tried to compare the political killings of the late Okonta and Independent National Electoral Commission ad hoc staff on the rerun election day in Rivers State to the fire accident that occurred at the home of the INEC Resident Electoral Commissioner in Kano State days after the elections of 2015. On the Rivers Monorail project Amaechi started, which Wike said that he would abandon, the former governor said Wike needed to know that the monorail belongs to Rivers State and not his “Amaechi’s” private monorail. He said, “Pray, Governor Wike, which Rivers people told you not to touch the monorail project? Is it the same Rivers people that have consistently praised the project and see it as a catalyst to jump-start the local economy and place the state at the forefront of transport infrastructural development in Africa? “Or is Wike aggregating the jaundiced views of the coterie of court-jesters that hang around him daily, as the opinion of the entire people of the state? He said that Wike also described several ongoing projects in the state when he (Amaechi) left office as ‘abandoned projects’ that the former governor claimed to have completed or about to complete. The former governor said Wike specifically mentioned the Ogoni-Andoni-Opobo Unity Road that connects the Island of Opobo to Andoni and the rest of the state. “What a shameless lie! This project was ongoing and was almost completed as at May 29, 2015. May we also remind Wike that the Eagle Island- Diobu Road that he once claimed to have been abandoned was 90 per cent completed with just the final course of coal tar remaining as at when he succeeded Amaechi,” the former governor added.